Tripp Lite's SR42UBCL Colocation Rack Enclosure Server Cabinet is the ideal storage solution for multi-user server and networking applications. This 42U enclosure cabinet is packed with features designed to simplify rack equipment installations and rack equipment maintenance: top-panel cable routing ports, perforated doors to promote efficient airflow, adjustable mounting rails, toolless vertical PDU mounting and more. And as part of the SmartRack® family, the SR42UBCL is compatible with Tripp Lite's vast selection of rackmount accessories, enabling you to customize your solution to meet any requirement. The SR42UBCL ships fully assembled for quick installation. With two 20U compartments separated by a divider panel, the SR42UBCL provides different users safe, secure access to their section of the cabinet. The SR42UBCL uses the same footprint of a standard enclosure, with each compartment containing its own front and rear access doors with unique combo locks so only facility managers have secure access to their equipment. 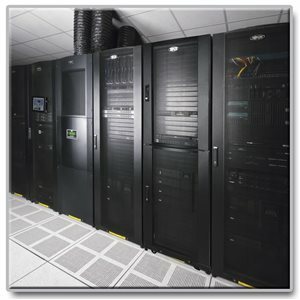 The SR42UBCL is optimized for data center and other dense IT applications. Its massive front-to-rear ventilation capacity (door perforation pattern providing 65+% open space) meets or exceeds server manufacturer requirements. The SR42UBCL offers full compatibility with a wide range of airflow optimization and cable management accessories. Its integrated baying tabs make it easy to combine multiple enclosure cabinets in rows for data centers. For high-density applications, the SR42UBCL is also 100% compatible with today's state-of-the-art hot-aisle/cold-aisle data center configurations. With a standard 24-in. width, the SR42UBCL is compatible with all 19-in. rack equipment. Its rails are adjustable in quarter-inch increments to accommodate equipment depths from 4 to 37 inches. Adjustment is quick and convenient—simply unscrew the rails, slide them to the desired depth and restore the screws. An easy-view depth index ensures consistent rail placement without requiring time-consuming measurements. The rails are capable of supporting up to 3000 lbs. of equipment with included installation hardware and feature square mounting holes. Each rack space within the enclosure cabinet is numbered for ready reference. The SR42UBCL’s two adjustable vertical mounting rails support toolless button-mount 0U installation of compatible PDUs and cable managers. Each rail can accommodate two vertical PDUs or cable managers side by side, for a total of four units per enclosure cabinet. These vertical mounting rails make it easier to route power and cabling to installed rack equipment. They also reduce cord and cable clutter that could block airflow through the enclosure cabinet. The SR42UBCL is designed to provide a safe, secure installation solution for mission-critical rackmount equipment. It features locking, removable front and rear doors that are perforated to promote efficient airflow, and locking, removable side panels. Locking doors and side panels prevent unauthorized access to installed equipment. The side panels are half size (two per side) for ease of removal and reinstallation. Both front doors are reversible and the dual split rear door design reduces clearance requirements for service access so the enclosure cabinet can be placed closer to a wall. The top panel of the SR42UBCL is furnished with vents designed to help remove warm air from the enclosure cabinet and draw in cool air by convection. It also supports installation of standard user-supplied case fans. The top panel contains cable routing ports and is designed for quick, toolless removal no need to disconnect cables. An open bottom facilitates cable access. All components of the SR42UBCL are grounded to the enclosure cabinet frame. Front and rear threaded grounding points are provided for connection to the facility earth ground. The removable front and rear doors feature quick-release ground wires. To simplify deployment, the SR42UBCL comes with preinstalled casters and leveling feet. The casters allow the SR42UBCL to be easily maneuvered into the desired location, where it can then be secured in place by adjusting the leveling feet. The SR42UBCL has a rolling load capacity of 2250 lbs., enabling rack equipment to be installed in the enclosure cabinet prior to final deployment. Note: The casters are intended for minor position adjustments within the final installation area only and are not designed for moving the enclosure cabinet over long distances. The SR42UBCL comes with a 5-year product warranty and a rapid-response repair/replacement policy that's unmatched in the industry. The SR42UBCL also meets all requirements towards Payment Card Industry Data Security Standard (PCI DSS) compliance. This unit is manufactured in compliance with strict RoHS specifications, reflecting Tripp Lite’s commitment to environmental responsibility.